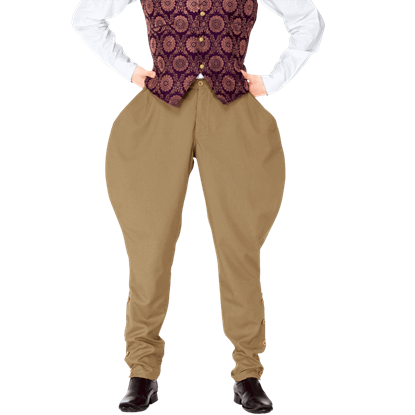 Whether your style tends toward Neo-Victorian gentleman or airship captain, we have a pair of mens steampunk pants for you! We carry an assortment of Neo-Victorian breeches, steampunk trousers, and other steampunk legwear for every kind of steampunk cosplay. 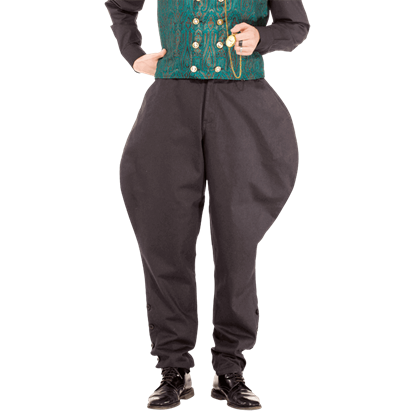 Our mens period pants look fantastic with steampunk dress shirts, while our steampunk jodhpurs go great with many alternative history ensembles. Mens steampunk knickers offer a great alternative to long vintage trousers during the summer months. Made from fine materials, our mens steampunk apparel comes in a variety of sizes to help you find your ideal fit. Browse through our mens steampunk pants to find the right pair to go with the rest of your steampunk ensemble. 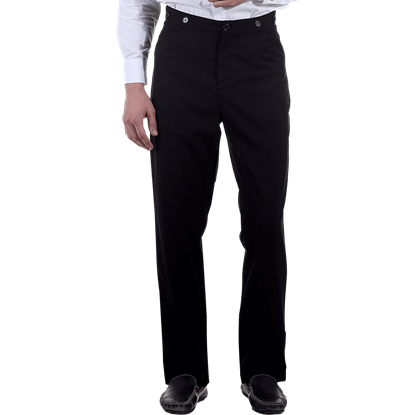 Whether you are patrolling the airship hangars or perfecting your polo swing, these Admiral Bartholomew Black Pants will ensure you always turn up in style. These trousers are exceptional for Steampunk soirees or an officers ball. 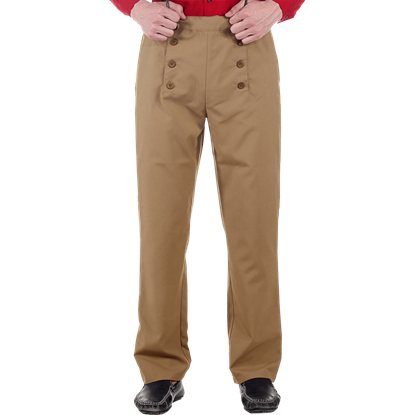 Perfect for a Steampunk outfit, polo player cosplay, or military costume, these Admiral Bartholomew Khaki Pants are made from a rayon/polyester blend fabric. These trousers feature attractive ballooning at the hips and a fitted waist. 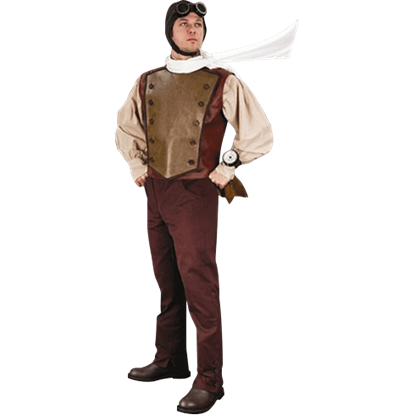 These chocolate brown cotton blend pants have piping along the pockets with five antiqued brass buttons (which matches the Airship Flying Vest) at the split bottom cuffs. 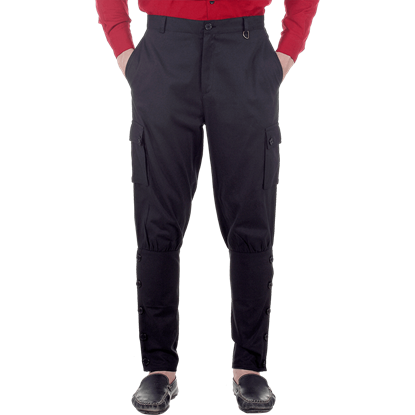 Our Airship Pants are available in sizes Small through X-Large. When you need distinctive pants to go with your equally eye-catching outfit, be sure to check out the Black Airship Pants. These steampunk trousers flare out around the upper legs and then become fitted around the calves. Inspired by the Jodhpur pant style which became a favorite riding garment amongst the affluent in England in the late 19th century, the Black Airship Steampunk Trousers are a fantastic addition to your steampunk attire. 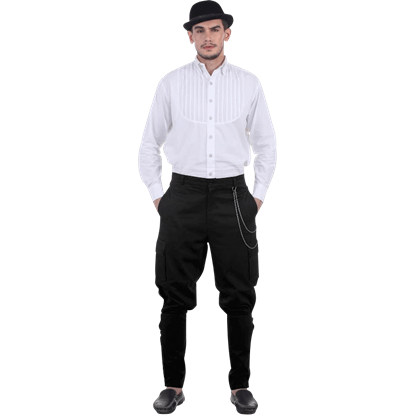 In an elegant and versatile design perfect for achieving the look of a Victorian gentleman or a steampunk engineer, the Black Architect Steampunk Trousers features a high-waist cut and a button up flap which covers the fly. Whether you want to add a vintage twist to your ensemble or create an authentic period look, these period trousers offer a fun choice. 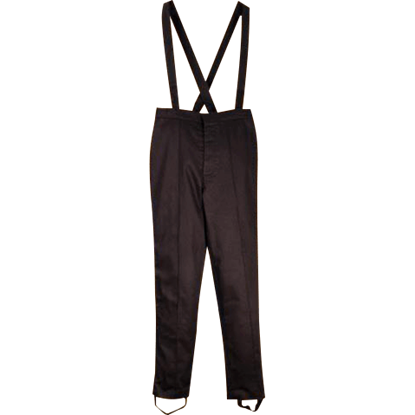 The Black Embroidered Suspender Pants display an intricate floral design over the straps. 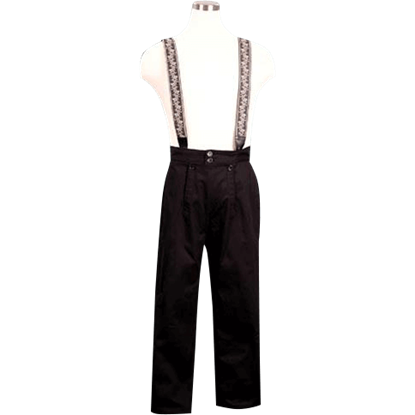 Featuring a stylish high-waist Victorian cut that pairs exquisitely with suspenders and a matching period shirt, the Black Victorian Trousers are a magnificent way for steampunk fans to embody the look of a dapper Victorian gentleman. Developed in India in the late 19th century, Jodhpurs became incredibly popular riding trousers in England. 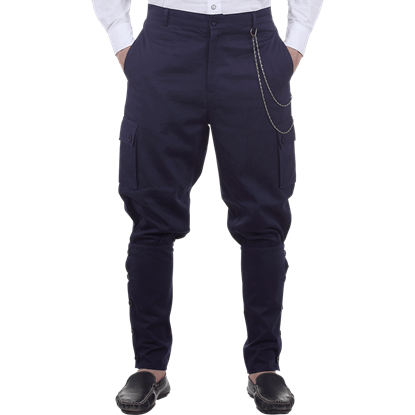 The Blue Airship Steampunk Trousers employ this classic styling in a design which is perfect for the Victorian gentleman. These tight-fitting, black Britannia military pants make a period-perfect addition to your outfit. The Britannia Empire Suspender Pants feature a sharp design that looks great with period attire, as well as steampunk apparel. Even in an alternate universe, feeling like an outsider can be hard to overcome. 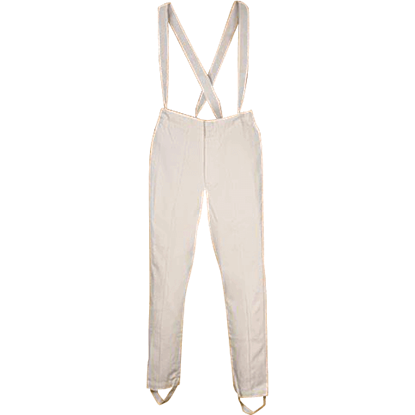 Gentlemen of all statures can combat this with the Britannia White Suspender Pants, the perfect way to make any ensemble be on par with high society. An extraordinary piece of steampunk apparel, the Brown Steampunk Architect Pants feature a high-waist Victorian cut with a sleek button up flap which covers the fly and heightens the historic styling of this design.